I have bought some black organza for the transparent layer of this work in progress. Having marked out the circular shape, I painted around the outside of the circle with clear nail varnish to prevent fraying when I trim it to shape. 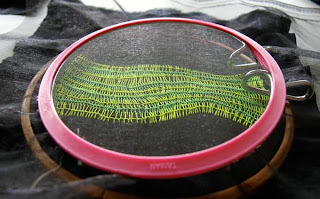 I am still not sure how to construct the piece so that the organza layer is removable: perhaps I will mount it on a wire ring like this embroidery hoop and stitch it to the main piece at a single point on the edge of the circle. With the public lecture and exhibition on May 4th creeping up quickly, I really need to decide how I am going to display all of the works I have made. I don't think sticking them to the wall with adhesive tape is going to cut the mustard!